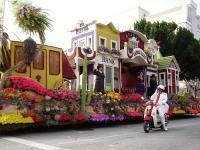 This festival has been a Pasadena tradition for over a century and is one of the most colourful events in the world. The New Year's Day celebrations feature the Rose Parade, which is a breathtaking spectacle of marching bands, equestrian units and magnificent floats, completely covered in flowers and petals. Float construction takes about a year to complete and the Post Parade is an opportunity for the public to admire the fantastic workmanship and the floral creativity from close up. After the parade the Rose Bowl Game takes place between two college champions and is renowned as the 'Superbowl' of college football.